Al-Mosailem (Al-Ahli), Al-Mayouf (Al-Hilal), Al-Owais (Al-Ahli). Osama Hawsawi (Al-Hilal), Omar Hawsawi (Al-Nassr), Al-Harbi (Al-Ahli), Al-Shahrani (Al-Hilal), Motaz Hawsawi (Al-Ahli), Al-Breik (Al-Hilal), Al-Bulaihi (Al-Hilal). Al-Jassim (Al-Ahli), Al-Shehri (Leganés), Al-Faraj (Al-Hilal), Al-Khaibri (Al-Hilal), Al-Dawsari (Villarreal), Al-Mogahwi (Al-Ahli), Otayf (Al-Hilal), Kanno (Al-Hilal), Al-Khaibari (Al-Shabab), Bahebri (Al-Shabab). Al-Muwallad (Levante), Al-Sahlawi (Al-Nassr), Assiri (Al-Ahli). Armani (River Plate), Caballero (Chelsea), Guzmán (Tigres). Ansaldi (Torino), Mercado (Siviglia), Otamendi (Manchester City), Fazio (Roma), Rojo (Manchester United), Acuña (Sporting Lisbona), Tagliafico (Ajax). Mascherano (Hebei China Fortune), Pavón (Boca Juniors), Meza (Independiente), Di Maria (PSG), Lo Celso (PSG), Lanzini (West Ham), Banega (Siviglia), Biglia (Milan), Salvio (Benfica). Dybala (Juventus), Higuaín (Juventus), Messi (Barcellona), Agüero (Manchester City). Ryan (Brighton), Jones (Feyenoord), Vukovic (Genk). Sainsbury (Grasshoppers), Behich (Bursaspor), Degenek (Yokohoma F. Marinos), Risdon (Western Sydney Wanderers), Jurman (Suwon Bluewings), Meredith (Milwall). Jedinak (Aston Villa), Milligan (Al-Ahli), Rogic (Celtic), Luongo (QPR), Mooy (Huddersfield), Irvine (Hull City), Petratos (Newcastle Jets), Arzani (Melbourne City). Cahill (Milwall), Kruse (Bochum), Leckie (Hertha Berlino), Juric (Lucerna), Maclaren (Hibernian), Nabbout (Urawa Red Diamonds). Courtois (Chelsea), Mignolet (Liverpool), Casteels (Wolfsburg). Alderweireld (Tottenham), Boyata (Celtic), Kompany (Manchester City), Meunier (PSG), Vermaelen (Barcellona), Vertonghen (Tottenham). Chadli (WBA), De Bruyne (Manchester City), Dembele (Tottenham), Dendoncker (Anderlecht), Fellaini (Manchester United), Tielemans (Monaco), Witsel (Tianjin Quanjian). 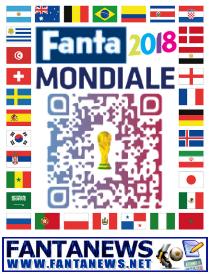 Batshuayi (Chelsea), Carrasco (Dalian Yifang), E. Hazard (Chelsea), T. Hazard (Borussia Mönchengladbach), Januzaj (Real Sociedad), Lukaku (Manchester United), Mertens (Napoli). Alisson (Roma), Ederson (Manchester City), Cássio (Corinthians). Miranda (Inter), Marquinhos (PSG), Thiago Silva (PSG), Marcelo (Real Madrid), Filipe Luís (Atletico Madrid), Fagner (Corinthians), Pedro Geromel (Gremio), Danilo (Manchester City). Casemiro (Real Madrid), Fernandinho (Manchester City), Paulinho (Barcellona), Renato Augusto (Beijing Guoan), Coutinho (Barcellona), Willian (Chelsea), Fred (Shakhtar Donetsk). Gabriel Jesus (Manchester City), Firmino (Liverpool), Douglas Costa (Juventus), Taison (Shakhtar Donetsk), Neymar (PSG). Ospina (Arsenal), Vargas (Deportivo Cali), J. F. Cuadrado (Once Caldas). Arias (PSV), Fabra (Boca Juniors), D. Sánchez (Tottenham), Zapata (Milan), Mina (Barcellona), Mojica (Girona), Murillo (Pachuca). Aguilar (Deportivo Cali), Barrios (Boca Juniors), James Rodríguez (Bayern Monaco), C. Sánchez (Espanyol), Lerma (Levante), Quintero (River Plate), J. Cuadrado (Juventus), Uribe (America). Falcao (Monaco), Bacca (Villarreal), Borja (Palmeiras), Izquierdo (Brighton), Muriel (Siviglia). Jo Hyeon-woo (Daegu), Kim Jin-hyeon (Cerezo Osaka), Kim Seung-gyu (Vissel Kobe). Oh Ban-seok (Jeju United), Hong Cheol (Sangju Sangmu), Jang Hyun-soo (FC Tokyo), Park Ju-ho (Ulsan Hyundai), Jung Seung-hyeon (Sagan Tosu), Yun Yeong-seon (Seongnam), Lee Yong (Jeonbuk Hyundai Motors), Kim Young-gwon (Guangzhou Evergrande). Koo Ja-cheol (Augsburg), Lee Jae-seong (Jeonbuk Hyundai Motors), Kim Min-uh (Sanju Sangmu), Ju Se-jong (Asan Mugungwa), Moon Seon-Min (Incheon United), Ki Sung-yeung (Swansea), Jung Woo-young (Vissel Kobe), Go Yo-han (FC Seoul). Hwang Hee-chan (RB Salisburgo), Son Heung-min (Tottenham), Lee Seung-woo (Hellas Verona), Kim Shin-uk (Jeonbuk Hyundai Motors). Navas (Real Madrid), Pemberton (Alajuelense), Moreira (Herediano). Gamboa (Celtic), Smith (Norrköping), Matarrita (New York City FC), Oviedo (Sunderland), Duarte (Espanyol), González (Bologna), Calvo (Minnesota United), Waston (Vancouver Whitecaps), Acosta (Aguilas Doradas). Guzmán (Portland Timbers), Tejeda (Losanna), Borges (Deportivo La Coruña), Azofeifa (Herediano), Wallace (New York City FC), Ruiz (Sporting Lisbona), Colindres (Saprissa), Bolaños (Saprissa). Venegas (Saprissa), Campbell (Betis Siviglia), Ureña (Los Angeles FC). Subasic (Monaco), L. Kalinic (Gent), Livakovic (Dinamo Zagabria). Corluka (Lokomotiv Mosca), Vida (Besiktas), Strinic (Milan), Lovren (Liverpool), Vrsaljko (Atletico Madrid), Pivaric (Dinamo Kiev), Jedvaj (Bayer Leverkusen), Caleta-Car (Salisburgo). Modric (Real Madrid), Rakitic (Barcellona), Kovacic (Real Madrid), Badelj (Fiorentina), Brozovic (Inter), Bradaric (Rijeka). Mandzukic (Juventus), Perisic (Inter), N. Kalinic (Milan), Kramaric (Hoffenheim), Pjaca (Juventus), Rebic (Eintracht Francoforte). Schmeichel (Leicester), Ronnow (Brondby), Lössl (Huddersfield). Kjaer (Siviglia), M. Jorgensen (Huddersfield), Stryger Larsen (Udinese), Knudsen (Ipswich), Vestergaard (Borussia Mönchengladbach), Christensen (Chelsea), Dalsgaard (Brentford). Kvist (Copenaghen), Eriksen (Tottenham), Schöne (Ajax), Delaney (Werder Brema), Sisto (Celta Vigo), Lerager (Bordeaux), Krohn-Dehli (Deportivo La Coruña). N. Jorgensen (Feyenoord), Poulsen (Lipsia), Cornelius (Atalanta), Braithwaite (Bordeaux), Fischer (Copenaghen), Dolberg (Ajax). El-Hadary (Al Taawoun), El-Shennawy (Al Ahly), Ekramy (Al Ahly). Fathy (Al Ahly), Samir (Al Ahly), Ashraf (Al Ahly), Hamdy (Zamalek), Abdel-Shafy (Al Fateh), Hegazi (WBA), Gabr (WBA), Elmohamady (Aston Villa), Gaber (Los Angeles FC). Hamed (Zamalek), Shikabala (Al Raed), Said (KuPS), Morsy (Wigan), Elneny (Arsenal), Kahraba (Al-Ittihad), Sobhi (Stoke City), Trezeguet (Kasimpasa), Warda (Atromitos). Mohsen (Al Ahly), Salah (Liverpool). Lloris (Tottenham), Mandanda (Marsiglia), Areola (PSG). Sidibé (Monaco), Pavard (Stoccarda), Umtiti (Barcellona), Varane (Real Madrid), Kimpembe (PSG), Rami (Marsiglia), Mendy (Manchester City), Hernández (Atletico Madrid). Pogba (Manchester United), Tolisso (Bayern Monaco), Matuidi (Juventus), Kanté (Chelsea), Nzonzi (Siviglia). Griezmann (Atletico Madrid), Giroud (Chelsea), Mbappé (PSG), Dembélé (Barcellona), Thauvin (Marsiglia), Fekir (Lione), Lemar (Monaco). Neuer (Bayern Monaco), ter Stegen (Barcellona), Trapp (PSG). Ginter (Borussia Mönchengladbach), Hector (Colonia), Boateng (Bayern Monaco), Hummels (Bayern Monaco), Süle (Bayern Monaco), Kimmich (Bayern Monaco), Plattenhardt (Hertha Berlino), Rüdiger (Chelsea). Brandt (Bayer Leverkusen), Draxler (PSG), Goretzka (Schalke 04), Gündogan (Manchester City), Khedira (Juventus), Kroos (Real Madrid), Özil (Arsenal), Reus (Borussia Dortmund), Rudy (Bayern Monaco). Gómez (Stoccarda), Müller (Bayern Monaco), Werner (Lipsia). Kawashima (Metz), Higashiguchi (Gamba Osaka), Nakamura (Kashiwa Reysol). Nagatomo (Inter), Makino (Urawa Red Diamonds), Yoshida (Southampton), H. Sakai (Marsiglia), G. Sakai (Amburgo), Shoji (Kashima Antlers), Endo (Urawa Red Diamonds), Ueda (Kashima Antlers). Hasebe (Eintracht Francoforte), Honda (Pachuca), Inui (Eibar), Kagawa (Borussia Dortmund), Yamaguchi (Cerezo Osaka), Haraguchi (Fortuna Düsseldorf), Usami (Fortuna Düsseldorf), Shibasaki (Getafe), Oshima (Kawasaki Frontale). Okazaki (Leicester), Osako (Colonia), Muto (Mainz). Butland (Stoke City), Pickford (Everton), Pope (Burnley). Alexander-Arnold (Liverpool), Cahill (Chelsea), Delph (Manchester City), Jones (Manchester United), Maguire (Leicester City), Rose (Tottenham), Stones (Manchester City), Trippier (Hotspur), Walker (Manchester City), Young (Manchester United). Alli (Tottenham), Dier (Tottenham), Henderson (Liverpool), Lingard (Manchester United), Loftus-Cheek (Chelsea). Kane (Tottenham), Rashford (Manchester United), Sterling (Manchester City), Vardy (Leicester), Welbeck (Arsenal). Beiranvand (Persepolis), Mazaheri (Zob Ahan), Abedzadeh (Maritimo). Montazeri (Esteghlal), Rezaeian (Oostende), Pouraliganji (Al-Sadd), Mohammadi (Akhmat Grozny), Khanzadeh (Padideh), Cheshmi (Esteghlal), Hosseini (Esteghlal). Hajsafi (Olympiacos), Shojaei (AEK Atene), Dejagah (Nottingham Forest), Amiri (Persepolis), Ebrahimi (Esteghlal), Ezatolahi (Amkar Perm), Torabi (Saipa), Ghoddos (Östersund). Ansarifard (Olympiacos), Ghoochannejhad (Heerenveen), Jahanbakhsh (AZ), Azmoun (Rubin Kazan), Taremi (Al-Gharafa). Halldorsson (Randers), Runarsson (Nordsjaelland), Schram (Roskilde). Arnason (Aberdeen), A. Skulason (Lokeren), Saevarsson (Valur), Ingason (Rostov), Magnusson (Bristol City), Eyjolfsson (Levski Sofia), R. Sigurdsson (Rostov). J. Gudmundsson (Burnley), Bjarnason (Aston Villa), Traustason (Malmö), Hallfredsson (Udinese), G. Sigurdsson (Everton), O. Skulason (Karabükspor), Gislason (Sandhausen), Fridjonsson (Valerenga), Gunnarsson (Cardiff). Finnbogason (Augsburg), Sigurdarson (Rostov), Bodvarsson (Reading), A. Gudmundsson (PSV). Munir (Numancia), Bounou (Girona), Tagnaouti (Ittihad). Benatia (Juventus), Saiss (Wolverhampton), Da Costa (Basaksehir), Benoun (Raja Casablanca), Dirar (Fenerbahce), Achraf (Real Madrid), Mendyl (Lille). Boussoufa (Al-Jazira), El Ahmadi (Feyenoord), Ait Bennasser (Caen), S. Amrabat (Feyenoord), Belhanda (Galatasaray), Fajr (Getafe), Harit (Schalke 04). Boutaib (Malatyaspor), Bouhaddouz (St. Pauli), El Kaabi (Berkane), N. Amrabat (Leganés), Carcela (Standard Liegi), Ziyech (Ajax). Ochoa (Standard Liegi), Talavera (Toluca), Corona (Cruz Azul). Reyes (Porto), Salcedo (Eintracht Francoforte), Moreno (Real Sociedad), Layún (Siviglia), Gallardo (Pumas), Ayala (Tigres), Álvarez (America). Herrera (Porto), Guardado (Betis Siviglia), Márquez (Atlas), J. dos Santos (Los Angeles Galaxy), Fabián (Eintracht Francoforte), G. dos Santos (Los Angeles Galaxy). Aquino (Tigres), J. M. Corona (Porto), Jiménez (Benfica), Peralta (America), Hernández (West Ham), Vela (Los Angeles FC), Lozano (PSV). Uzoho (Deportivo La Coruña), Ezenwa (Enyimba), Akpeyi (Chippa United). Shehu (Bursaspor), Ebuehi (ADO), Echiejile (Cercle Bruges), Idowu (Amkar Perm), Awaziem (Nantes), Troost-Ekong (Bursaspor), Balogun (Brighton), Omeruo (Kasimpasa). Obi Mikel (Tianjin Teda), Onazi (Trabzonspor), Ndidi (Leicester), Etebo (Las Palmas), Ogu (Hapoel Be’er Sheva), Obi (Torino). Musa (CSKA Mosca), Iheanacho (Leicester), Moses (Chelsea), Ighalo (Changchun Yatai), Iwobi (Arsenal), Simy (Crotone). Calderón (Chorrillo), Penedo (Dinamo Bucarest), A. Rodríguez (San Francisco). Baloy (Municipal), Cummings (San José Earthquakes), Davis (Dunajska Streda), Escobar (New York Red Bulls), Machado (Houston Dynamo), Murillo (New York Red Bulls), Ovalle (CD Olimpia), R. Torres (Seattle Sounders). Bárcenas (Tapachula), Cooper (Universidad de Chile), Godoy (San José Earthquakes), Gómez (Bucaramanga), Pimentel (Plaza Amador), Quintero (Universitario), J. Rodríguez (Gent). Arroyo (Alajuelense), Díaz (Deportivo La Coruña), Pérez (Municipal), Tejada (Sports Boys), G. Torres (Huachipato). Gallese (Veracruz), Carvallo (UTC), Cáceda (Deportivo Municipal). Advíncula (BUAP), Araujo (Alianza Lima), Corzo (Universitario), Loyola (Melgar), Ramos (Veracruz), Rodríguez (Junior), Santamaría (Puebla), Trauco (Flamengo). Aquino (BUAP), Cartagena (Veracruz), Cueva (San Paolo), Flores (Aalborg), Hurtado (Vitoria Guimaraes) , Tapia (Feyenoord), Yotún (Orlando City). Guerrero (Flamengo), Carrillo (Watford), Ruidíaz (Morelia), Farfán (Lokomotiv Mosca), Polo (Portland Timbers). Bialkowski (Ipswich), Fabianski (Swansea), Szczesny (Juventus). Bednarek (Southampton), Bereszynski (Sampdoria), Cionek (SPAL), Glik (Monaco), Jedrzejczyk (Legia Varsavia), Pazdan (Legia Varsavia), Piszczek (Borussia Dortmund). Blaszczykowski (Wolfsburg), Goralski (Ludogorets), Grosicki (Hull City), Krychowiak (WBA), Kurzawa (Gornik Zabrze), Linetty (Sampdoria), Peszko (Lechia Danzica), Rybus (Lokomotiv Mosca), Zielinski (Napoli). Kownacki (Sampdoria), Lewandowski (Bayern Monaco), Milik (Napoli). Lopes (Lione), Beto (Goztepe), Rui Patricio (Sporting Lisbona). Bruno Alves (Rangers), Cédric (Southampton), José Fonte (Dalian Aerbin), Mário Rui (Napoli), Pepe (Besiktas), Guerreiro (Borussia Dortmund), Ricardo (Porto), Rúben Dias (Benfica). Adrien Silva (Leicester City), Bernardo Silva (Manchester City), Bruno Fernandes (Sporting Lisbona), João Mário (West Ham United), João Moutinho (Monaco), Manuel Fernandes (Lokomotiv Mosca), William Carvalho (Sporting Lisbona). André Silva (Milan), Cristiano Ronaldo (Real Madrid), Gelson Martins (Sporting Lisbona), Gonçalo Guedes (Valencia), Quaresma (Besiktas). Akinfeev (CSKA), Gabulov (Bruges), Lunev (Zenit San Pietroburgo). Granat (Rubin Kazan), Kudryashov (Rubin Kazan), Kutepov (Spartak Mosca), Ignashevich (CSKA), Semenov (Akhmat Grozny), Smolnikov (Zenit San Pietroburgo), Fernandes (CSKA). Gazinsky (Krasnodar), Golovin (CSKA), Dzagoev (CSKA), Yerokhin (Zenit San Pietroburgo), Zhirkov (Zenit San Pietroburgo), Kuzyaev (Zenit San Pietroburgo), Zobnin (Spartak Mosca), Samedov (Spartak Mosca), Anton Miranchuk (Lokomotiv Mosca), Cheryshev (Villarreal). Dzyuba (Arsenal Tula), Aleksey Miranchuk (Lokomotiv Mosca), Smolov (Krasnodar). Diallo (Rennes), Gomis (SPAL), K. N’Diaye (Horoya). Gassama (Alanyaspor), Ciss (Valenciennes), Koulibaly (Napoli), Mbodji (Anderlecht), Sabaly (Bordeaux), Sané (Hannover), Wague (Eupen). Gueye (Everton), Kouyate (West Ham), A. N’Diaye (Wolverhampton), B. Ndiaye (Stoke City), Ndoye (Birmingham), Sarr (Rennes). Keita (Monaco), Diouf (Stoke City), Konaté (Amiens), Mané (Liverpool), Niang (Torino), Sakho (Rennes), Sow (Bursaspor). Stojkovic (Partizan), Rajkovic (Maccabi Tel Aviv), Dmitrovic (Eibar). Ivanovic (Zenit San Pietroburgo), Kolarov (Roma), Rukavina (Villarreal), Tosic (Besiktas), Spajic (Krasnodar), Veljkovic (Werder Brema), Milenkovic (Fiorentina), Rodic (Stella Rossa). Tadic (Southampton), Matic (Manchester United), Ljajic (Torino), Milivojevic (Crystal Palace), Kostic (Amburgo), Zivkovic (Benfica), Grujic (Cardiff), Milinkovic-Savic (Lazio), Radonjic (Stella Rossa). Mitrovic (Fulham), Prijovic (PAOK), Jovic (Eintracht Francoforte). De Gea (Manchester United), Reina (Napoli), Kepa (Athletic Bilbao). Carvajal (Real Madrid), Odriozola (Real Sociedad), Piqué (Barcellona), Ramos (Real Madrid), Nacho (Real Madrid), Azpilicueta (Chelsea), Alba (Barcellona), Monreal (Arsenal). Busquets (Barcellona), Koke (Atletico Madrid), Saúl (Atletico Madrid), Thiago (Bayern Monaco), Silva (Manchester City), Iniesta (Barcellona). Isco (Real Madrid), Asensio (Real Madrid), Vázquez (Real Madrid), Aspas (Celta Vigo), Rodrigo (Valencia), Costa (Atletico Madrid). Olsen (FC Copenhagen), Johnsson (Guingamp), Nordfeldt (Swansea). Lustig (Celtic), Lindelöf (Manchester United), Granqvist (Krasnodar), Olsson (Swansea), Augustinsson (Werder Brema), Helander (Bologna), Jansson (Leeds), Krafth (Bologna). Forsberg (Lipsia), Ekdal (Amburgo), Claesson (Krasnodar), Svensson (Seattle Sounders), Larsson (Hull City), Durmaz (Tolosa), Hiljemark (Genoa), Rohden (Crotone). Berg (Al Ain), Toivonen (Tolosa), Guidetti (Celta Vigo), Thelin (Waasland-Beveren). Sommer (Borussia Mönchengladbach), Bürki (Borussia Dortmund), Mvogo (Lipsia). Lichtsteiner (Juventus), Djourou (Antalyaspor), Rodríguez (Milan), Schär (Deportivo La Coruña), Lang (Basilea), Moubandje (Tolosa), Akanji (Borussia Dortmund), Elvedi (Borussia Mönchengladbach). Behrami (Udinese), Shaqiri (Stoke City), G. Fernandes (Eintracht Francoforte), Dzemaili (Bologna), Xhaka (Arsenal), Zuber (Hoffenheim), Freuler (Atalanta), Zakaria (Borussia Mönchengladbach). Seferovic (Benfica), Drmic (Borussia Mönchengladbach), Embolo (Schalke 04), Gavranovic (Dinamo Zagabria). Mathlouthi (Al-Batin), Ben Mustapha (Al-Shabab), Hassen (Chateauroux). Nagguez (Zamalek), Bronn (Gent), Bedoui (Etoile du Sahel), Benalouane (Leicester), Ben Youssef (Kasimpasa), Meriah (Sfaxien), Haddadi (Digione), Maaloul (Al Ahly). Badri (Esperance), Skhiri (Montpellier), Ben Amor (Al-Ahli), Chaalali (Esperance), Sassi (Al-Nassr), Khalil (Club Africain), Khaoui (Troyes), Srarfi (Nizza), Sliti (Digione). Ben Youssef (Al-Ettifaq), Khazri (Rennes), Khalifa (Club Africain). Muslera (Galatasaray), M. Silva (Vasco da Gama), Campaña (Independiente). Godín (Atletico Madrid), Coates (Sporting Lisbona), Giménez (Atletico Madrid), Maxi Pereira (Porto), G. Silva (Independiente), Cáceres (Lazio), Varela (Peñarol). Nández (Boca Juniors), Torreira (Sampdoria), Vecino (Inter), Bentancur (Juventus), Sánchez (Monterrey), De Arrascaeta (Cruzeiro), Laxalt (Genoa), Rodríguez (Peñarol), Urretaviscaya (Monterrey). Stuani (Girona), Gómez (Celta Vigo), Cavani (PSG), Suárez (Barcellona). Finalmente sono uscite le liste della Gazzetta per giocare al Fantamondiale.